I’m ready to call bullsh*t on the notorious “Red Star of David” anti-Trump meme that has swept the Intertubes. 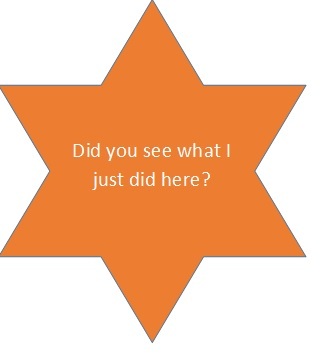 Stars of David are not red (blue border on white field); ghetto stars used by the Nazis were yellow; and the red star, among other things, is the shoulder badge of the US Army’s 6th Infantry Division. The six-sided star is part of the library of shapes in Microsoft Word and Paint, and it provides a nice big field to insert some derogatory phrasing. In my version of Word, by the way, the default fill color is blue—Israel blue!—and I had undo the blue and put in the red fill. Hmmm. And one really has to wonder if Trump—who presumably has the white nationalist vote sewed up, has a Jewish son-in-law, and is determinedly trying to get into Sheldon Adelson’s wallet with pro-Israel rhetoric at the moment—really decided this was the occasion to make a derogatory anti-Semitic association with Hillary Clinton and her affinity for large helping of cash from corporate and, via the Clinton Foundation, foreign sources, many of which are from the unpopular Gulf/Muslim quadrant. By the time I got to it, the @FishBoneHead account had been deleted and all I could do was scroll through the mentions for a sense of the milieu. As far as I could tell, virulently anti-Clinton with a side order of “Obama betraying America to the Muslims”. FishBoneHead1 is a jerk, but he doesn’t appear to be a Jew-hating jerk. He just likes making dumb images out of simpleminded right-wing memes, using the most obvious graphic techniques. He probably thought a six-pointed star would accommodate the words better — if he’d wanted to dog-whistle, the star would have been yellow. I concur. 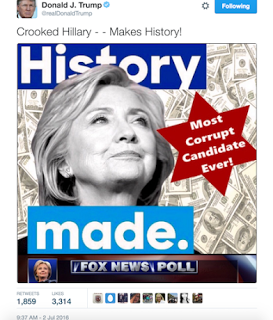 So I doubt either @FishBoneHead or Trump were engaged in anti-Semitic dogwhistling with the red star. I do not agree with the assessment, in other words, of Sam Stein and Sam Levine of the Huffington Post, as summarized in their headline: Donald Trump Launches Blatantly Anti-Semitic Attack Against Hillary Clinton: This is not a dog whistle. It’s not subtle. Excuse me. If it was meant as a dog whistle, Trump would have kept it up, denied the truth, reveled in the publicity, in other words dog whistled as he worked raking in the cash. Instead he hastily took down the star tweet in a fug of embarrassment, replacing it with a red meatball whose offense to the sensibilities of the Japanese royal family was miraculously ignored. On July 3, Trump also tweeted an encomium to Elie Wiesel, which did not earn him much love with the /pol/ set. My anti-Semito-skepticism is also fueled by the fact that accusations of anti-Semitism have become the lingua francaof liberal political agitation at home as well as abroad. The Blairites in the UK’s Labour Party—who have worked hand-in-glove with political consultants in the United States since the Bill Clinton days—mounted a ferocious attack on the purported anti-Semitism of Jeremy Corbyn over a period of months, presumably as part of their “Corbyn coup” scheme. It recently climaxed with the Guardian bigfooting Corbyn’s report on anti-Semitism in the Labour Party by spuriously claiming that Corbyn had analogized Israel to ISIS. Allies of the Clinton campaign “saw their opportunities and they took ‘em” in other words, creating a media firestorm over unlucky clipart choices and, I expect, to their relief managing to distract somewhat from the fact that their candidate had just spent several hours with the FBI discussing her dodgy e-mail server. Make no mistake about it, the Trump campaign has a serious anti-Semitism problem. But the question is, how much of it is Trump and how much of it is his supporters, and how much is torched off courtesy of Clinton, Trump’s myriad other political enemies, and a hostile media. Is Trump the active impresario of an anti-Semitic movement? 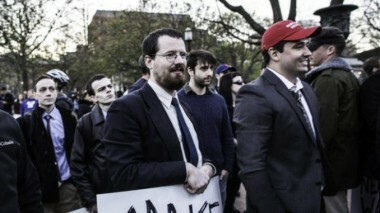 The Alt Right movement of deliberately offensive transgressive provocateurs who gave us Gamergate has adopted Trump as its mascot thanks to his cultivation of disgruntled white conservative males, and their web-centric followers provide much of the torrent of on-line anti-Semitic invective unleashed against Jews who, in their estimation, offend against “Daddy Trump”. But Trump himself relies on xenophobia against Hispanics and Muslims and racially-inflected smears against President Obama to fire up his base. That’s enough. He doesn’t need to play the anti-Semite card. I doubt Trump is particularly grateful to Alt Right for adding “anti-Semite” to his portfolio of epithets, given the historical/Israel/fundraising/media headaches it brings along. The section of electorate for whom “he’s going down the path of Hitler” is a matter of fear and execration is pretty big…as is the benefit to Clinton of successfully associating Trump with the ultimate political taboo of Fascism. The leading actual neoreactionaries are not fans of Donald Trump. “Trump appears to have no ideology at all and very little historical/intellectual awareness of his context,” Moldbug — who now just goes by his birth name, Curtis Yarvin — writes in an email. Yarvin apparently would like to see Elon Musk or Jeff Bezos take the reins, by the way. Looking forward to the Washington Post coverage of that particular movement. And reporters have yet to find the Holy Grail—Trump making explicitly bigoted remarks about Jews. Mandel [a journalist critical of Trump who writes for the Forward & other publications] estimates she has faced thousands of anti-Semitic messages online, mostly from self-identified white nationalists who are passionate Trump supporters — as made clear by their exhortations to “make America great again” and the Trump imagery in their user profiles. The messages she has received (“Die, you deserve to be in an oven,” for example) are tame compared to the pictures (Mandel’s face superimposed on that of a Holocaust victim). Mandel estimated that she has blocked 1,000 users on Twitter who have gone after her. Mandel got her gun and alerted local police, who now monitor her home. Mandel also wrote a piece for the Jewish Forward: “My Trump Tweets Earned Me So Many Anti-Semitic Haters That I Bought A Gun.” It went viral. Julia Ioffe and Jonathan Weisman of the NY Times got similar attention from pro-Trump anti-Semites. Felix Salmon also got the treatment for his criticisms of Brexit (a Trump fave), as I recall. There are others. Don’t try to discount the impact by parsing the authenticity of the threats. The fear is real. So is the anger. NY Magazine ran a very useful piece by Jesse Singal on the association of Trumpism with racial bigotry. It focused on Ben Shapiro, a right wing media figure who left Breitbart, a major platform for Trump, and endured the full range of anti-Semitic castigation as a result. Awareness of popular anti-Semitism constellating around Trump—and the unnerving litany of abuse and threats unleashed against Jewish journalists with Trump not making any serious effort to acknowledge and disavow it—permeates coverage of his campaign, in my opinion. The Clinton campaign obviously regards the allegations of Trump anti-Semitism as campaign gold, accusations that place Trump beyond the moral pale, stop him in his tracks, and force him to respond. 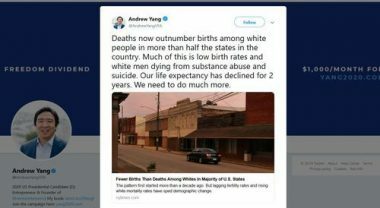 Since Trump is persona non grata among many mainstream conservative as well as liberal journalists (it’s also a fact that some of the most conspicuous victims of the Alt Right jihad have been conservative Jewish journalists), the media appears happy to oblige, even when innuendo, extrapolation, speculation, and association have to bear an inordinate share of the evidentiary burden. So the red star story, despite its dubious circumstances and context, gets the four-alarm-fire treatment. I’m in the minority, I’m sure, but I don’t think bad journalism in a good cause is a good thing. One Comment to "Red Star Over Trump"
The real issue is whether political contribution should be considered as a kind of corruption. If yes, associating a red star with corruption is reasonable. As a matter of fact, Jews like Zev Chafets, once Israel’s director of the Government Press Office, considered Jewish contribution a badge of honor.